Product prices and availability are accurate as of 2019-04-21 11:05:08 EDT and are subject to change. Any price and availability information displayed on http://www.amazon.com/ at the time of purchase will apply to the purchase of this product. DO NOT attempt to open or dismantle the Solar Charger. DO NOT subject the Solar Charger to knock or blow. DO NOT subject the Solar Charger to naked flames or extreme heat. DO NOT put it on your car dash for solar charging. DO NOT stand on or otherwise apply pressure to the Solar Charger. DO NOT allow children to play with Solar Charger. BUILT-IN Ultra Bright 4 LED Flashlight with 3 modes normal/flash/SOS. Dual USB ports (1A/2.4A) helps you charge 2 devices at the same time. 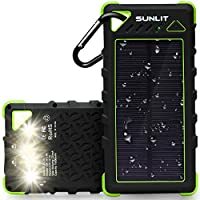 Solar panel designed for ?EMERGENCY charging while Camping/Hiking/Climbing. 4 LED battery indicator lights(25%, 50%, 75%, 100%) flashing green while charging from sunlight, flashing blue while charging from AC power. Non-slip surface for better handling. Multi-protections to protect itself from overload, overvoltage, overcurrent, overcharge, over-discharge, over-heating. TPU and ABS+PC material for extra protection and durability. 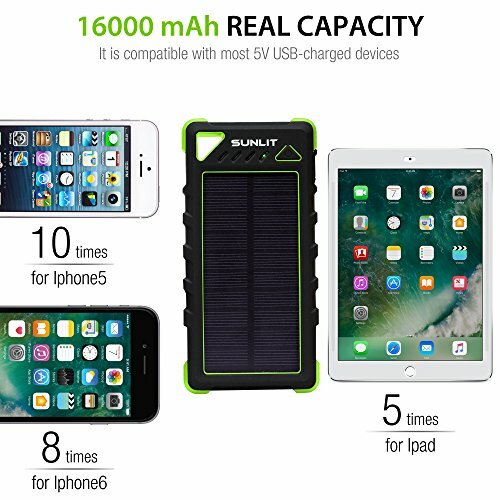 ?FREE GIFT "Dual USB charger android/apple"
?16000mAh REAL CAPACITY, NOT fake 24000mAh(24000mAh should weight almost 2lbs) or 15000mAh(actually 10000mAh). 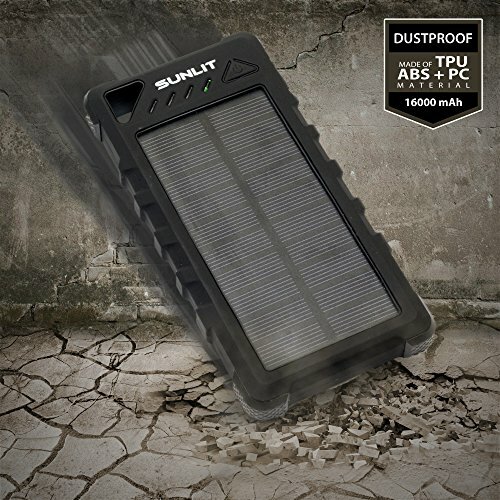 SUNLIT solar power bank ?16000mAh battery is compatible with most 5V USB-charged devices. ?Dual USB ports (1A/2.4A) helps you charge 2 devices at the same time wherever you are and ?NEVER worrying about running out of batteries. ? SAFE CHARGING. 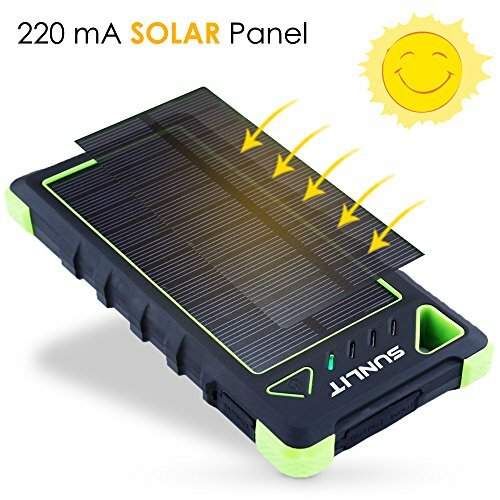 SUNLIT solar charger provides you with ?OVER CHARGE PROTECTION, ?OVER DISCHARGE PROTECTION, ?OVERVOLTAGE PROTECTION, ?OVERCURRENT PROTECTION, ?OVERPOWER PROTECTION, ?TEMPERATURE PROTECTION, ?SHORT-CIRCUIT PROTECTION, ?ANTI-DISCHARGE PROTECTION. ? SOLAR CHARGING. Solar panel is designed for ?EMERGENCY charging while ?Camping/Hiking/Climbing . It should ?NOT BE PRIMARY source of charging. ? WHAT'S IN THE BOX . 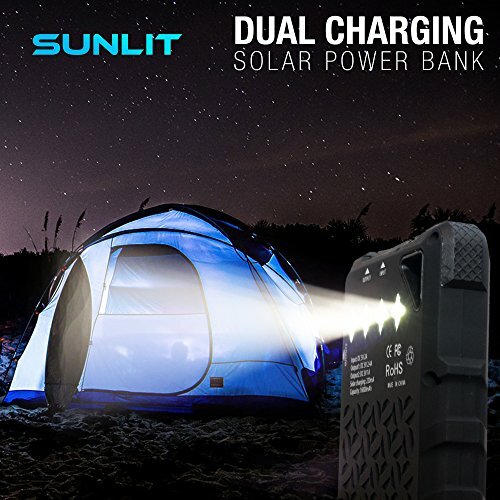 1 SUNLIT solar power bank, 1 micro USB cable for charging via AC power, 1 carabiner, ?FREE GIFT "Dual USB charger android/apple". Also we provide ?1 YEAR WARRANTY, contact us first with any questions, we are always happy to help. ? MOST DURABLE HEAVY DUTY CONSTRUCTION. 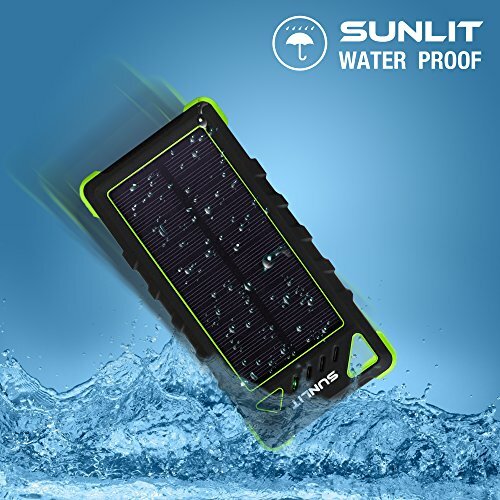 ?IP67 waterproof, ?dustproof, ?shockproof. Bumper frame made of TPU and ABS+PC material for extra protection and durability. ?Non-slip surface for better handling. Perfect Choice for camping/hiking/clambing and various outdoor activities. ?BUILT-IN Ultra Bright 4 LED Flashlight with 3 modes normal/flash/SOS can be used for your ?convenience, ?caution or ?SOS signal light. ?4 LED battery indicator lights(25%, 50%, 75%, 100%).